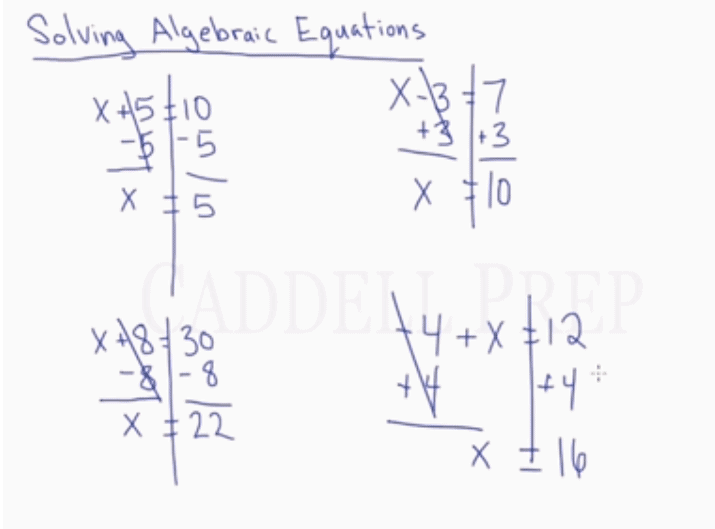 In this video, students will be learning how to solve algebraic equations using inverse operations. Let’s start off with some simple ones. To get the value of we have to subtract from both sides of the equation. It may be useful to draw a long vertical line through the equal sign. For you to remember that whatever you do on one side, you have to do on the other side, too. We have to subtract from both sides. And we will come up with . To get rid of we have to add on both sides. To get rid of we should add . Let’s now look at some examples involving multiplication. So for example, we have . This means . To do this, we have to identify that the inverse of multiplication is division. So we have to divide both sides by . We will come up with . Let’s have then divide both sides by to get . Don’t be tricked by the negative sign. It is not a subtraction sign. So to get rid of we just have to divide both sides by . Now, let’s have examples involving division. So we have to do the inverse of division which is multiplication. Let’s multiply both sides by . Let’s also try . Then multiply both sides by . We’ll have . 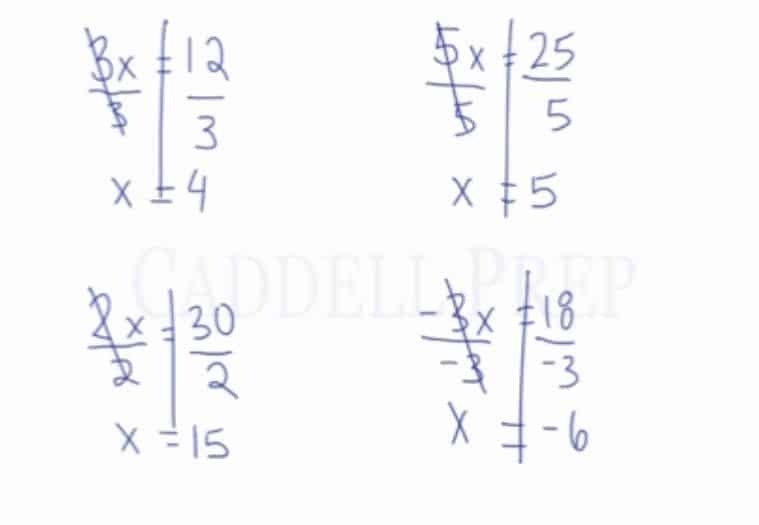 Here’s another method to solve equations involving division. You may have seen it before. It is called ‘cross-multiplication’. 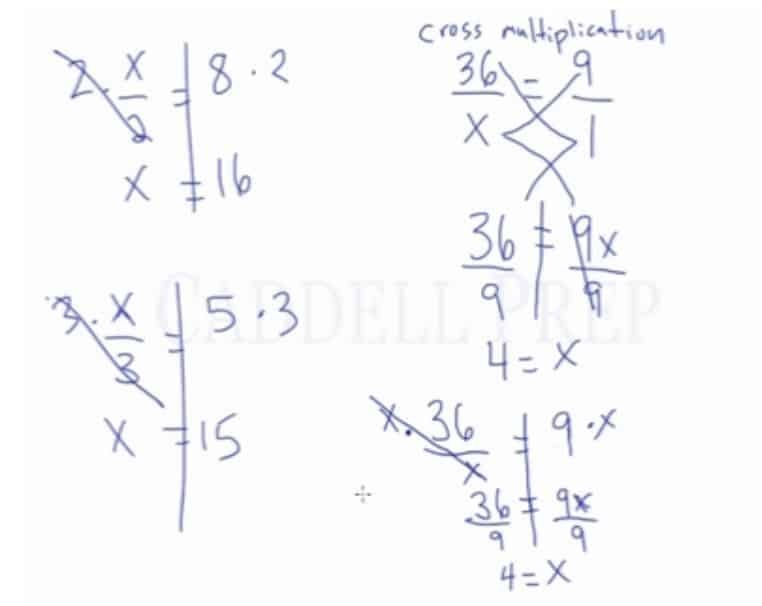 To do cross-multiplication, it’s important to show both sides of the equation as fractions. So we should have . What we’re going to do is . We still want to isolate so we’ll divide both sides by . Now let’s solve it without cross-multiplication. Let’s multiply both sides by and we have . This is similar to the one above. So let’s divide both sides by and we still find that . To sum up, for simple algebraic equations, we just can do inverse operations to get the value of .